Setting a place at the table for persons of all gender expressions and sexual orientations. 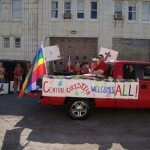 Central Christian Church, Indianapolis, IN, celebrates Pride in style! Personal Stories: Resources with a significant focus on personal experience and story. A guide that seeks to hear the voices of the lgbt persons in Hispanic churches and families, to faithfully integrate an excluded group of people back into the life of their churches and families, and to embolden Hispanic churches to follow the mission Christ gives to them — that of welcome and hospitality. A curriculum available for the Institute for Welcoming Resources which includes the All in God’s Family curriculum guide, the book Families Like Mine, the video In My Shoes: Stories of Youth with LGBT Parents, and the CD-ROM That’s So Gay: Portraits of Youth with LGBT Parents. This curriculum gives you opportunities to gather with other members of your congregation to pray, to learn, to share, and to work together to transform your lives, your congregation, and your world into a loving place in which God’s lesbian, gay, bisexual, and transgender families can thrive. Call Me Malcolm is the story of a young transgender man, his struggle with faith, family, and identity, and overcoming shame and fear with grace, compassion, and knowledge. It is an excellent video from the UCC. Click the more information link for a discussion guide. Revealing stories by forty diverse Americans, some well known and some not, plus insights from straight clergy and parents explaining their support of gay people as whole human beings guaranteed equal rights by our Constitution. A video produced by TCU students documenting the experience of LGBT students and faculty at the university. Provides insight into how our young people experience both anti-gay prejudice and affirming support. This is the story of a transgender man who has been an ordained elder in The United Methodist Church since 1984 and has quietly served his congregations for twenty-eight years before sharing his story and spiritual journey with his congregation, denomination, and the world. In God’s House: Asian American Lesbian & Gay Families in the Church is a quality 22 minute presentation on the experience of lesbian and gay Asian Americans in their churches and families. There is also a DVD available with subtitles in Chinese, Korean, Vietnamese, Indonesian, Japanese, Filipino. The DVD contains several special features, including a 30 minute Bible study on the Bible and homosexuality by Dr Kah-Jin Jeffery Kuan, Associate Professor of Old Testament at Pacific School of Religion; a study on a Theology of Acceptance by Rev. Nobuaki Hanaoka; and footage of the award-winning Gay Asian Pacific Alliance float in the 2006 San Francisco Chinese New Year parade, among other special features. You can find information on the DVD here. Rt. Rev. Robinson, raised in a Disciples family and now the retired openly gay Episcopal Bishop of New Hampshire, writes from the center of a storm of controversy raging in the Episcopal Church and the worldwide Anglican Communion, offering an honest, thoughtful portrait of the faith that has informed his life as well as and the controversy that continues to rock his Church. Drawing upon life history interviews with adults who were treated for intersexuality as children, Sharon E. Preves explores how such individuals experience and cope with being labeled sexual deviants in a society that demands sexual conformity. By demonstrating how intersexed people manage and create their own identities, often in conflict with their medical diagnosis, Preves argues that medical intervention into intersexuality often creates, rather than mitigates, the stigma these people suffer. In Justice Calls, Disciples Pastor Phil Snider collects sermons that add compelling clarity to the growing chorus of Christian voices that are passionate about LGBTQ justice and equality–not in spite of their faith but precisely because of it. With a combination of pastoral sensitivity, scholarly insight, and courageous vision, these sermons are a must-read not only for LGBTQ people longing to know they don’t have to deny their religious convictions in order to embrace their sexuality and/or gender identity, but also for people of faith who wonder if they have to disregard the Bible in order to fully accept their LGBTQ neighbors, friends, and family members. Justice Calls includes sermons and essays from many well known Disciples pastors and scholars: Rita Nakashima Brock, Derek Penwell, Sandhya Rani Jha, Christian Piatt, Glen Miles, and a host of other excellent writers. This volume is an ideal resource for small groups, Sunday school classes, preachers, church leaders, and all people everywhere who are interested in recognizing how the rich resources in the Bible can be cultivated in order to celebrate–rather than condemn–LGBTQ friends and neighbors. Starting with the call for equality and ending with a call for the transformation of the church, this volume walks the journey of God’s affirming love for all with both care and courage. The story of a mother’s struggle to reconcile the tension between her deeply held religious beliefs and the suicide of her gay son. Mary Griffith came from a religious family and raised her four children to believe in God and live a Christian life. Their church was the center of family life. When Bobby confided that he was gay, Mary convinced Bobby to pray that God would cure him and to seek solace in church activities. Bobby did it all, but the church’s hatred of homosexuality and the obvious pain his gayness was causing his family led to his suicide. Prayers for Bobby is also available on DVD and as an Amazon Instant Video. Forty writers address the question of how same-gender-loving black people affirm themselves as sexual and spiritual people. These sacred narratives are a canon for survival–holy texts proclaiming the divinity of their lives, the righteousness of their love, and the sanctity of their being. Provides insightful, practical guidance for all committed Christians who wonder how to relate to gay friends or family members–or who struggle with their own sexuality. Convinced that “in a culture that sees gays and Christians as enemies, gay Christians are in a unique position to bring peace,” Lee demonstrates that people of faith on both sides of the debate can respect, learn from, and love one another. Read the review of Torn published in Crossbeams. Dr. Tanis, through the use of personal stories and the journey of others, as well as scriptural and theological discussion, provides the reader with an insightful and knowledgeable discussion about gender variant people in the church. An evangelical pastor is fired because he has re-read the scripture and concluded that the evangelical rejection of LGBT people is misguided. In UnClobber Colby Martin tells his story and shares his understanding of the scriptures. A compilation of three groundbreaking films—Straight from the Heart (parents acceptance of their lgbt children), All God’s Children (Exploring homophobia and it’s effects on the African-American community), and De Colores (lives of families of gay and lesbian Latinos and Latinas as they struggle to accept their gay children).